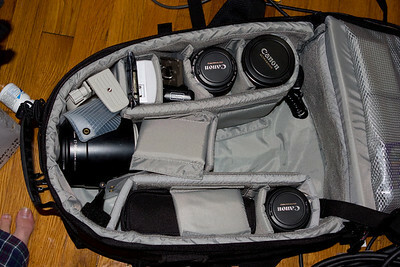 Lowepro Computrekker backpack. 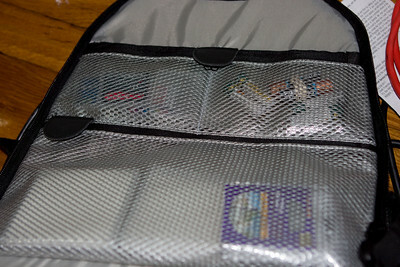 It stores most of my gear, plus it has a laptop sleeve (closest to my back), which fits my MacBook Pro. Demb Flash Diffuser is visible, AA Battery charger, ExpressCard CF reader, wireless flash trigger, tripod base, spare Canon batteries under, cable release. Missing is the EF 24-70 f/2.8L and my Digital Rebel XTi. Pockets: filters on the bottom, CF cards top left, AA batteries top right. 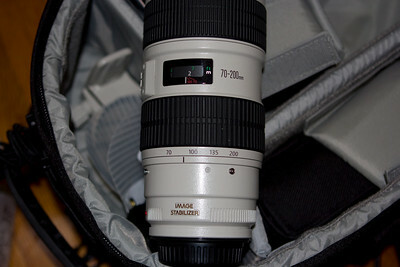 EF 70-200 f/2.8L IS. This is an amazing lens for portraits, wildlife... You can see the tripod ring inside the back on the left. The lens weighs a ton. The EF 85 f/1.8. My first lens after the kit lens. Amazingly sharp photos for a non-L lens, incredible value. 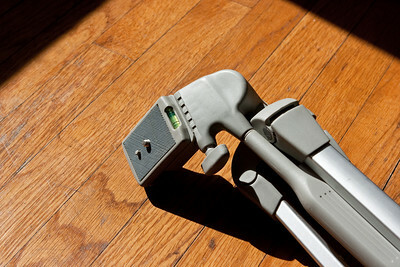 Great for portraits. Now partly displaced by the 70-200, but this is still better in low (natural) light. 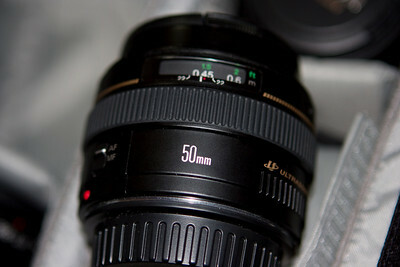 The EF 50mm f/1.4. A great starter lens. It makes a better kit lens than the original kit lens. 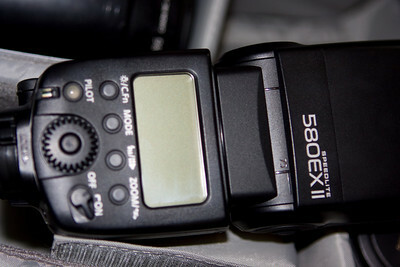 Good for low light, very sharp for a non-L lens. Unfortunately the Ultrasonic motor here is not the "ring type" but instead an inferior type. 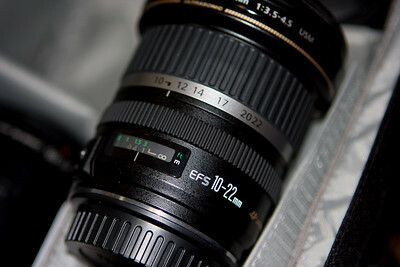 The EF-S 10-22mm. 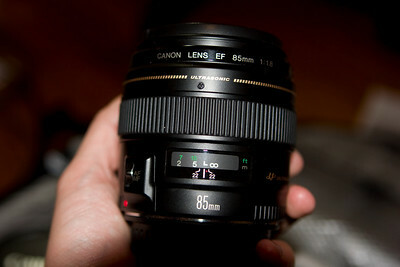 This is a great wide angle lens for crop (1.6) cameras. 10 is very wide, and 22 is quite usable for wide indoor shots, without too much distortion. 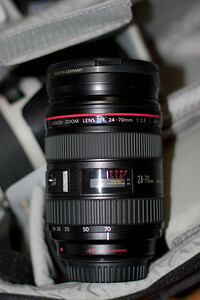 The EF 24-70 f/2.8L, which is my current "walkabout" lens. It covers an ideal focal length range for my crop camera, and the images it produces are incredibly sharp, even wide open. 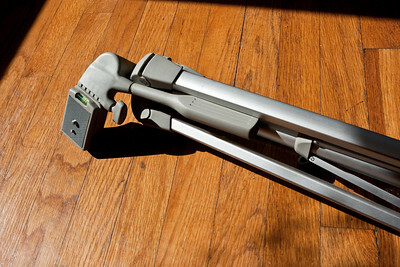 Here it is shown zoomed all the way in, the barrel extends at the wide end. This lens also does something magical with color and contrast - I get amazing contrast results right out of the camera. 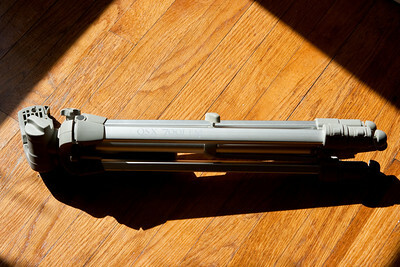 Note the 77mm UV filter on the end. The lens hood is not installed (but I usually use it in order to protect the lens). 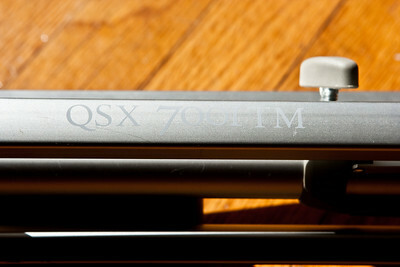 Quantaray QSX 7001 TM tripod - for sale.